The Galactica ship from the original series in 1:4105 scale! When assembled, measures 17 1/2-inches long x 7-inches wide. Glue and paint required, not included - skill level 3. 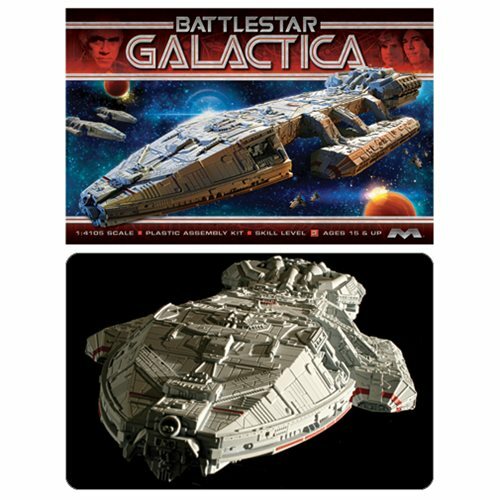 Build your very own Galactica ship from the original Battlestar Galactica! Give it a unique spin if you like with your own paint or go the traditional route. The Battlestar Galactica Original Series Galactica Model Kit is a 1:4105 scale recreation of the classic vehicle. An outstanding kit long overdue, the Original Series Galactica commemorates the 35th Anniversary of the original series and was made in the same scale as the Pegasus kit! When assembled the model measures 17 1/2-inches long x 7-inches wide. Glue and paint required, not included. Skill level 3.